FILE - A religious officer canes an Acehnese youth onstage as punishment for dating outside marriage, which is against Sharia, or Islamic law, outside a mosque in Banda Aceh, Aug. 1, 2016. Aceh's landscape is dotted with Saudi influence, but its religious climate is decidedly not. It could have been game, set and match for Saudi cultural expansion into Aceh, Indonesia's westernmost province, after it was wrecked by a 2004 tsunami that caused devastation across the region. Saudi Arabia immediately sent aid to the region which, in the face of such disaster, might have been unusually receptive to new ideas. If so, Aceh would have fallen in step with the large swaths of Indonesia, such as Java and Lombok, that have eagerly absorbed the Saudi campaign to spread fundamentalist Salafi Islam across the Muslim world. Thirteen years after the disaster, Aceh's landscape, capped by the dazzlingly rebuilt capital city of Banda Aceh, is dotted with Saudi donations: schools, orphanages, mosques. However, the religious climate is decidedly not Salafi. The province seems to have drawn a line in the sand to protect its own traditionalist — and quite conservative — Islamic culture against a puritanical Gulf ideology that seeks to return to the traditions of Koranic times. FILE - A worker installs the names of the victims of the 2004 Indian Ocean tsunami on the wall of the Tsunami Museum ahead of the 10th anniversary of the killer waves in Banda Aceh, Aceh province, Indonesia, Dec. 4, 2014. The grass-roots resistance to Salafism in Aceh, which crested in 2015 with full-blown protests, shows how the effects of Saudi religious investment can vary significantly depending on local contexts. After the tsunami, the Saudi Charity Campaign donated more than $45 million to Aceh, which included two orphanages, almost 500 houses, a hospital, and restoration of the Baiturrahman Mosque. In 2007, it also started a branch of LIPIA, the university whose flagship branch in Jakarta has been a tentpole of Saudi influence in the country. Today, LIPIA Banda Aceh has about 190 students between the ages of 18 and 23 and focuses on Arabic language instruction. A much larger campus is being constructed outside the capital, near the Sultan Iskandar Muda airport; it will be, like the current iterations, free for all students. "After LIPIA Banda Aceh, some students go on to study in Jakarta," said Syaikh Rasheed, a Saudi official who oversees the campus. "But if they are good, directly to Saudi Arabia," through one of the many scholarships the kingdom disburses in Indonesia. But in a striking contrast, none of the boys who study at LIPIA Banda Aceh are dressed in the typically Salafi way, with cropped pants and "sunnah" beards, unlike nearly all the male students at LIPIA Jakarta. If the new LIPIA Aceh campus offers a full curriculum that includes theology, it may engender some tensions. Salafi-oriented schools have been the target of attacks for two decades, according to the Institute for Policy Analysis and Conflict. In 1998, one school was actually burned down in Pidie Jaya, southeast of Banda Aceh. 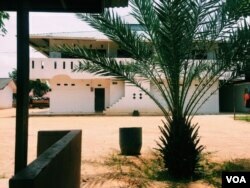 The Ma'had As Sunnah school in Lampeuneurut, Greater Aceh, which was started by a Saudi-educated Javanese teacher, was attacked by villagers in 2007. It is now quietly open and running, but its facilities are bare-bones, its mosque has been under partial construction for several years, and its faculty are extremely reticent to speak with outsiders. Taufiq, a construction worker at the school, said that although he works there, he won't send his own 14-year-old son there because "you need religion and school, but the Salafi establishments only have the former." Instead, he sends his son to a nearby Turkish school. Aceh — which, in the 13th century, was the first place in Indonesia to receive Islam — has very strong local traditions that have engendered fierce attachment through years of separatist struggle against Dutch, Japanese and Indonesian rule, although it reluctantly bowed to the last one after the tsunami. Aceh is the only province allowed to have Sharia, which seems, in theory, compatible with Salafism. But traditionalist Acehnese preachers follow the medieval Shafi'i school of thought, not the eightheenth century Salafi ideology. Acehnese culture prizes various things considered harmful bid'ah, or innovation, by Salafis: music, dance, celebrating the Prophet Muhammad's birthday. Even the infamous hardline group known as the Islamic Defenders Front (FPI) applies its thuggish tactics to support traditionalist preachers against Salafism. It was FPI who helped lead the "occupation" of the Baiturrahman Mosque during Friday prayers in June 2015, forcing the prayer leader to follow traditionalist rites during the service, in response to a perception that the mosque had become dangerously "Wahhabi," a somewhat negative term for Saudi Arabian Salafism. Tensions likely peaked in 2015 after several large parades in Banda Aceh. The re-election of Governor Irwandi Yusuf, a former separatist leader who also served as Aceh's first governor in 2005, will likely diffuse them further. Irwandi told VOA he is "not anxious about Wahhabism, at all." Had Yusuf's opponent, Muzakir Manaf — whose campaign explicitly courted traditionalist preachers — won the election, the pitch of religious discourse would likely have risen. But as it stands, the reform-minded Yusuf is more concerned with economics, which means the religious center is likely to continue to hold in Aceh. "The only thing investors think when they hear Aceh is Sharia,'" he said. "For merdeka [independence], we must have money." This is not to say that Salafism has been somehow overcome in Aceh; it remains to be seen how influential the huge new university is, for instance. But the province nevertheless shows how the effects of Saudi religious investment are not universal. This story was facilitated by a grant from the Pulitzer Center for Crisis Reporting.